Satellite laser ranging (SLR) to low Earth orbiters (LEOs) provides optical distance measurements with mm-to-cm-level precision. SLR residuals, i.e., differences between measured and modeled ranges, serve as a common figure of merit for the quality assessment of orbits derived by radiometric tracking techniques. We discuss relevant processing standards for the modeling of SLR observations and highlight the importance of line-of-sight-dependent range corrections for the various types of laser retroreflector arrays. A 1–3 cm consistency of SLR observations and GPS-based precise orbits is demonstrated for a wide range of past and present LEO missions supported by the International Laser Ranging Service (ILRS). A parameter estimation approach is presented to investigate systematic orbit errors and it is shown that SLR validation of LEO satellites is not only able to detect radial but also along-track and cross-track offsets. SLR residual statistics clearly depend on the employed precise orbit determination technique (kinematic vs. reduced-dynamic, float vs. fixed ambiguities) but also reveal pronounced differences in the ILRS station performance. Using the residual-based parameter estimation approach, corrections to ILRS station coordinates, range biases, and timing offsets are derived. As a result, root-mean-square residuals of 5–10 mm have been achieved over a 1-year data arc in 2016 using observations from a subset of high-performance stations and ambiguity-fixed orbits of four LEO missions. As a final contribution, we demonstrate that SLR can not only validate single-satellite orbit solutions but also precise baseline solutions of formation flying missions such as GRACE, TanDEM-X, and Swarm. 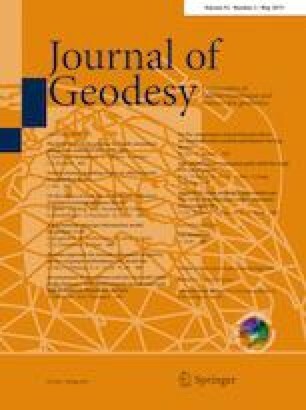 The authors are grateful to all members of the International Satellite Laser Ranging Service for their continued effort to collect and publicly provide SLR observations of geodetic satellites. Their work provides the basis for the present study and is an essential contribution to numerous space missions. We also acknowledge the use of various precise orbit determination products of low Earth orbit satellites shared by the Centre National d’Etudes Spatiales, the Copernicus POD Service, the European Space Agency ESA, the University of Texas, the Jet Propulsion Laboratory, and various other institutions. Their support is likewise highly appreciated.